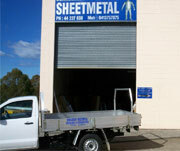 Welcome to Bomaderry Sheetmetal, with a combined experience of 55 years in detail sheetmetal, we would like to inform you that we cover every facet of the sheetmetal trade. Anything manufactured out of sheetmetal materials (eg.aluminium, galvanised, colourbond), to specialising in Stainless Steel work for Domestic and Commercial applications, eg. kitchen benchtops, splashbacks, rangehoods. Contact Bruce or Tim for a no obligation free quote, on all jobs large or small.